After selecting the overnight stops, the next task was to determine a route between Amtrak's Buffalo - Depew station and our first overnight - Lockport. The most direct route using NY 78 did not appear to be user (bicycle) friendly. The "Get Directions" feature of Google maps with its "street view" and a suggestion by velonomad on bikeforums.net were a big help in coming up with the route shown here. NOTE: it would be possible to save 8 miles by turning right at Stahl Road from N. Forest Road and going directly north to the canal at Wendelville. RT-277 (Union Rd) which becomes N Forest Rd was selected over Cayuga Road because it appeared to be more bike friendly. It turned out to be OK. 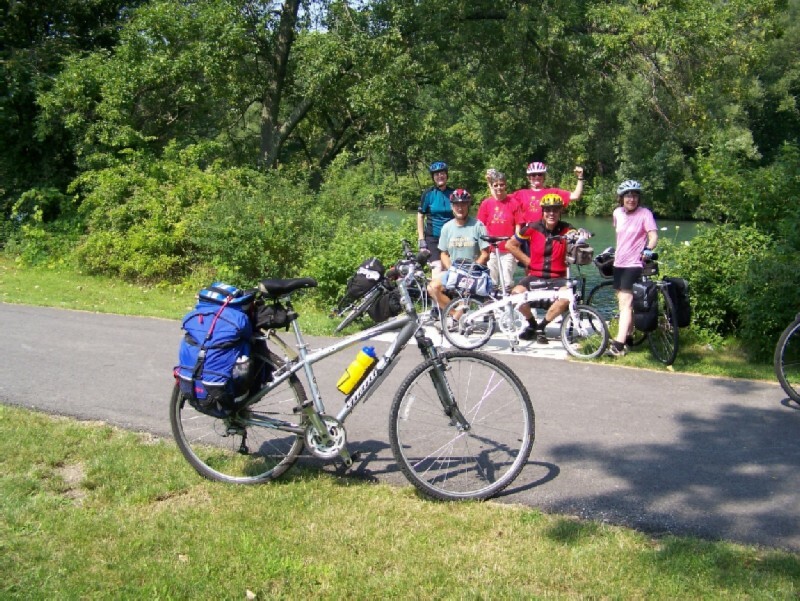 The bike path ends temporarily at Tonawanda Creek Road with a cemetery on the left. 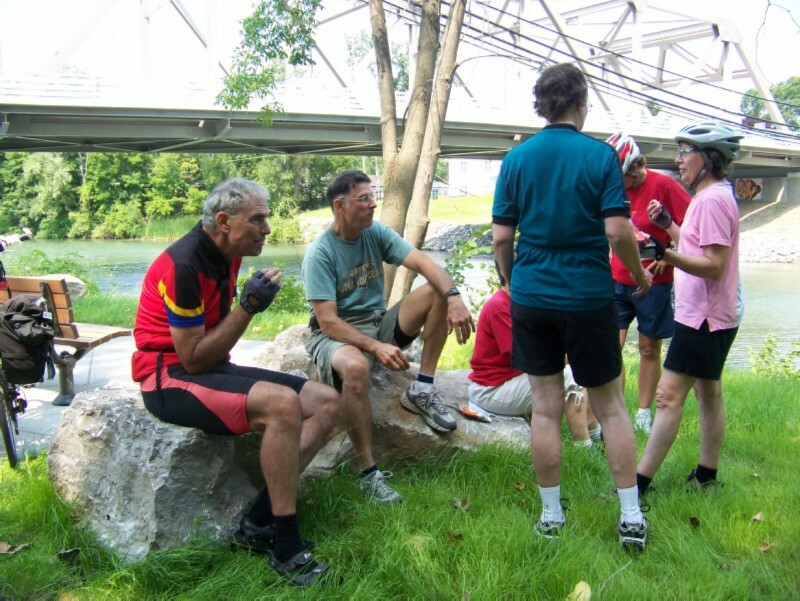 Cross Niagara Falls Road and continue straight on Tonawanda Creek Road for about 1.4 miles. Near the intersection with Sweet Home Road, the path reappears on the left. 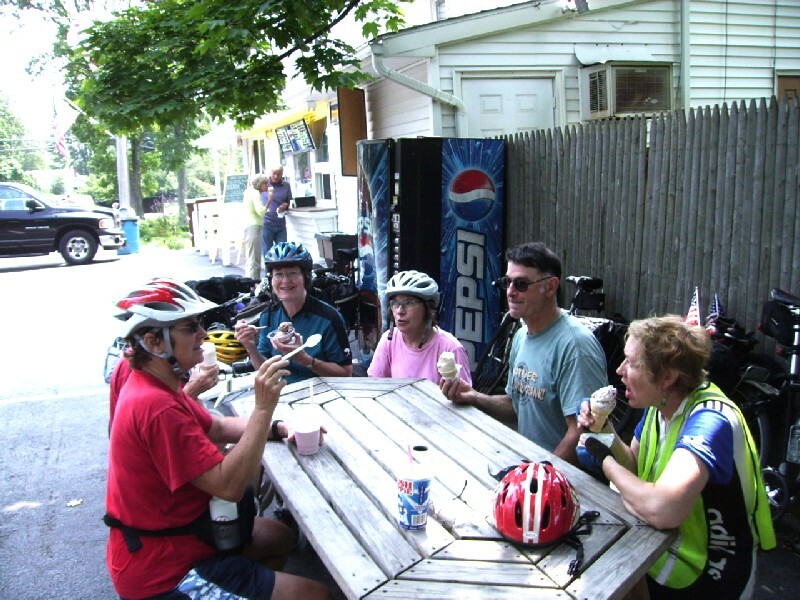 The bike path ended at New Road where we turned left across a bridge to Uncle G's Ice Cream Shop in the small village of Pendleton. The time and temperature were just right for ice cream at Uncle G's in Pendleton. I had become confused; and it took several helpful locals to get us going in the right direction. I could not understand why they said to take East Canal Road because I thought we had crossed the canal and were now on the west side. 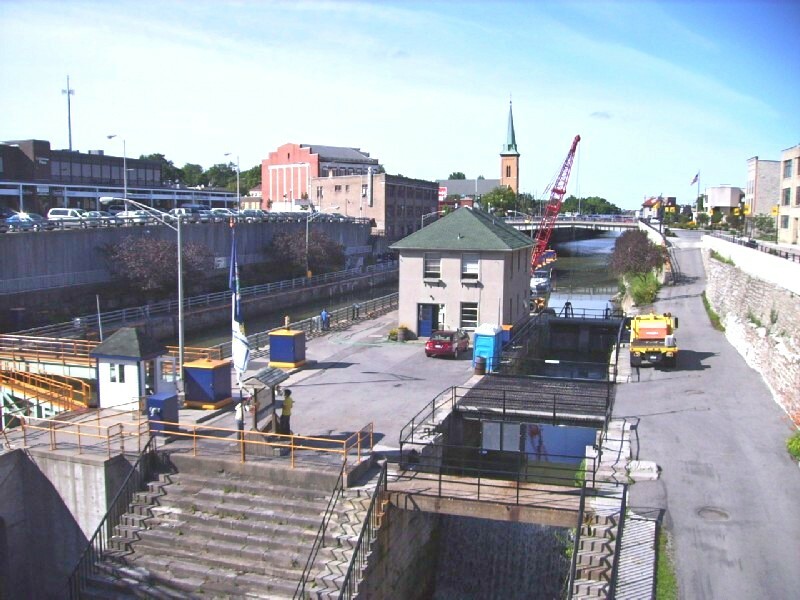 I kept looking for the canal to be on the right (to the east), but soon saw it on the left. It wasn't until I got a look at a good map that I realized we had crossed a creek, not the canal; and were still on the east side of it. We arrived early and had to call the proprietor. 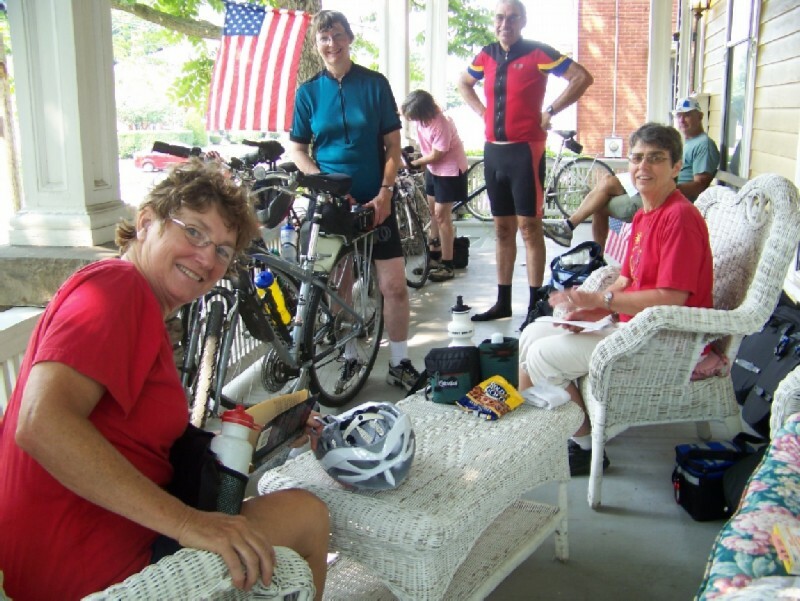 Cooling off and relaxing in comfortable chairs on the shaded front porch of the Hambleton House B&B was a real treat. 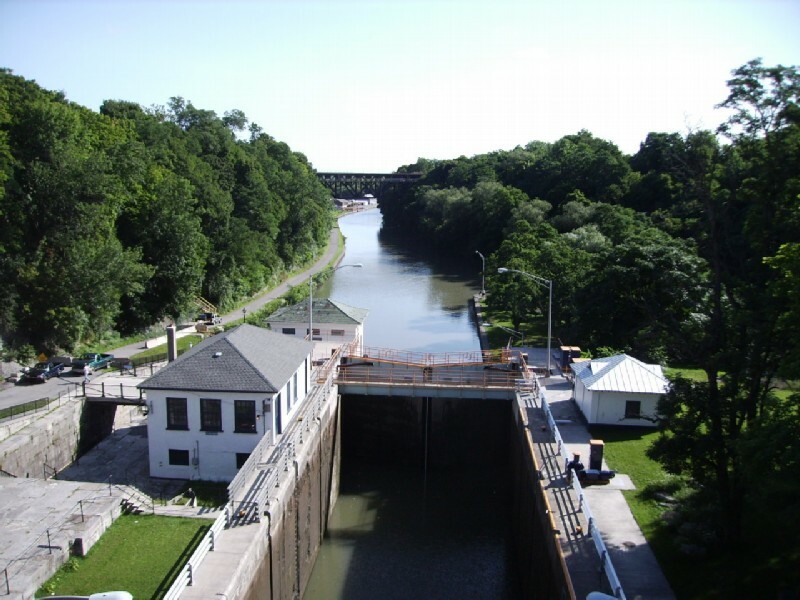 One of the Lockport locks looking west from the Pine Street bridge. The original canal (or is it the Civil War era enlarged version?) can be seen to the right, and the greatly enlarged 1918 barge canal to the left. Looking east from the Pine Street bridge. The bike path is seen to the left; but it was closed at this point due to a landslide.